The end of last year was tough for me, plagued by illness, grief and a gruelling recovery regime meant there wasn’t much time for relaxation. At the start of this year, I promised to take more time for me to help aid my recovery and my best friend and I decided that a spa break was in order! Unfortunately, spa breaks in the UK are bloody expensive. Not so unfortunately, they’re relatively cheap in Budapest! 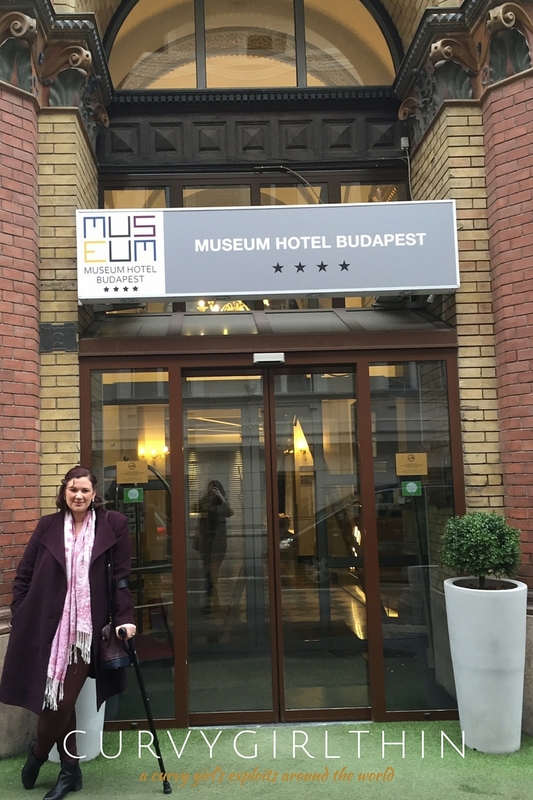 For £86, we got flights and 3 nights in a 4 star hotel (Hotel Museum Budapest) in the centre of the Jewish Quarter which is just a short stroll (or £2 taxi journey) to the centre. We booked through LastMinute.com which really did have a lot of really great late deals. We flew with the ultimate in budget airlines that is Wizz Air who were actually incredibly helpful – given that I’m on crutches and do struggle with navigating long walks in crowded areas under, they arranged for me to have wheelchair assistance and priority boarding. The staff were incredibly friendly and helpful and I cannot fault them – they even kept their calm when some cockney tw*t told them to learn English (they were a Hungarian crew who spoke very good English but *shock horror* they had Hungarian accents). I would caution to read the fine print before flying with this company though – they will charge you extra for everything they can! Want to print your boarding pass at the airport? £9 please. Want a standard size cabin bag instead of a handbag? £20 please. I’m glad I did read the small print and didn’t incur any extra charges! After dropping our bags at the hotel, we headed out to find a late lunch and some refreshments. 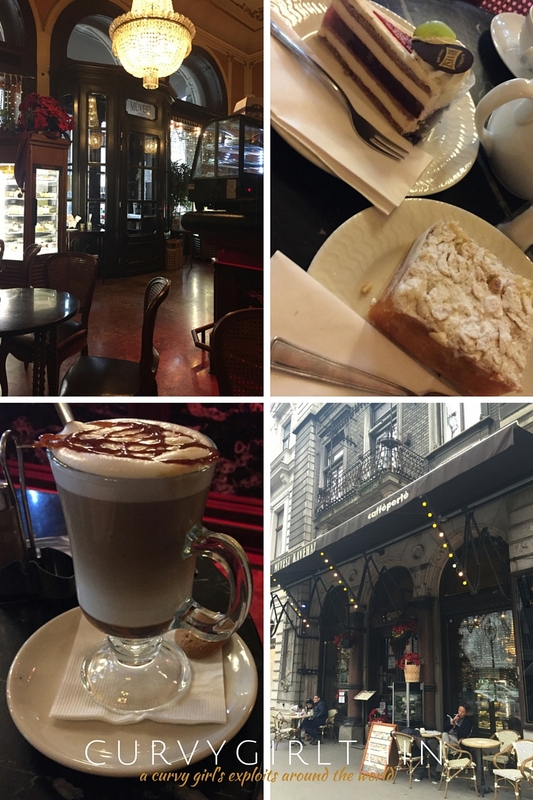 One thing that struck us immediately about the Jewish quarter was the sheer amount of cafes and pubs to eat in. There were a lot set up for the British stag do scene with sports and burger bars a plenty. 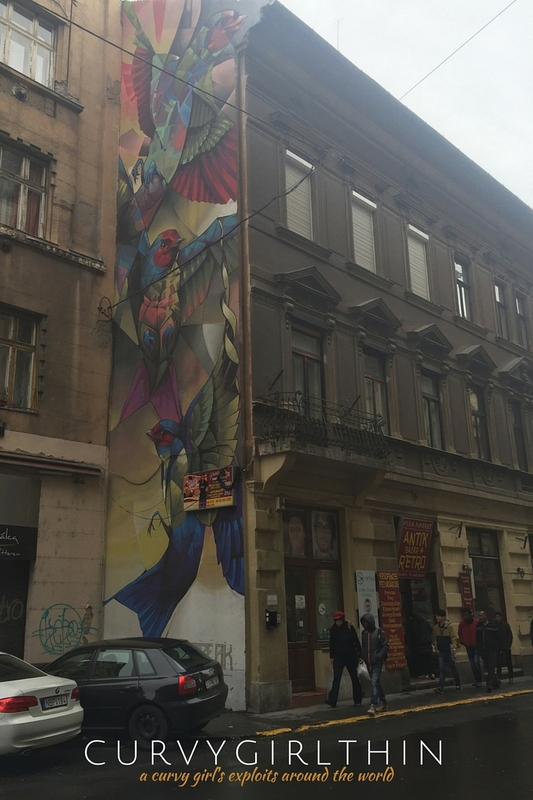 We were also struck by the sheer amount of graffiti – some of it your typical street art – some was the most amazing murals drawn on the side of nearly every building – it was pure art! We walked much further than expected, enjoying the streets of Budapest with their strange mix of old and new; the contrast of the brightly lit Istanbul Kebab shop next to the war torn buildings riddled with bullet holes and blast damage – a stark reminder that this country has a very recent, turbulent past. Eventually, we came across an arched doorway that led to one of the most beautiful restaurants I’ve ever seen. 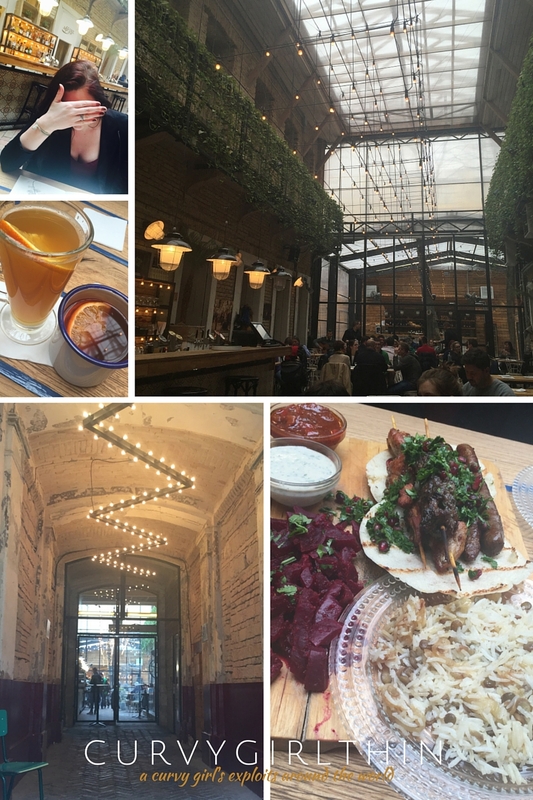 Mazel Tov is a gem of a Middle Eastern restaurant that is set in a beautiful court yard garden of un-burnished stone, draped vines and dim lightings. They have live jazz and acoustic music daily and do really great hot cocktails through the winter months – I can really recommend the Hot Ginger concoction of rum, lime, orange, honey & ginger beer. Tamara had the mulled wine which was also pretty damn delicious! The communal plate of sausages, kebabs, lentil rice, salad and the most deliciously spiced and grilled beetroot (of which it is my new mission to recreate) was simply delicious. Despite this, we got major food envy seeing the countless plates of schwarma coming out of the kitchens and resolved to come back later in the week for dinner! After several hours eating, drinking winter cocktails and sampling our first taste of Hungarian wine (less that a £1 a glass) whilst listening to the relaxing tones of the acoustic guitarist singing folk versions of modern pop songs, we headed back to the hotel to shower and don our red lipstick ready for a night watching ballet at the Hungarian State Opera House – a must for any culture bunny exploring the city! 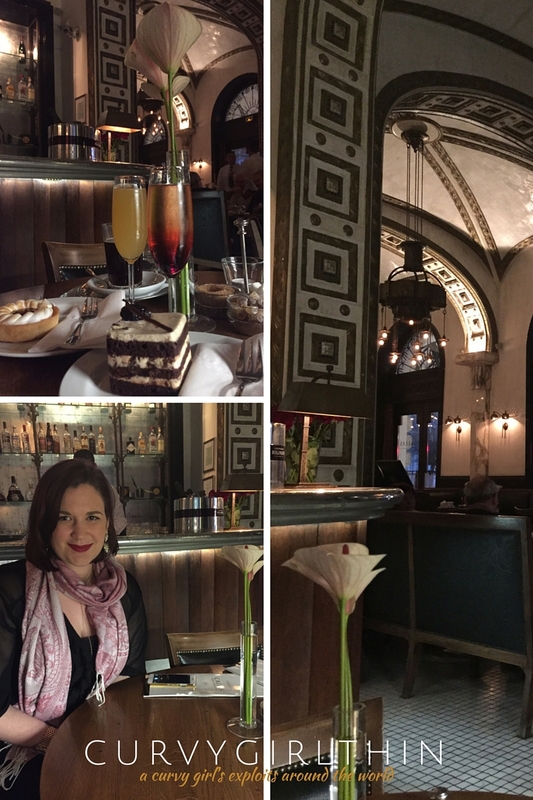 We did have time for cake before the performance and popped into Casa, a champagne restaurant that really is geared up to trap all the tourists planning on attending the opera. the cake there was divine – as was the champagne cocktails. Cake and champagne for dinner really is my favourite combination! 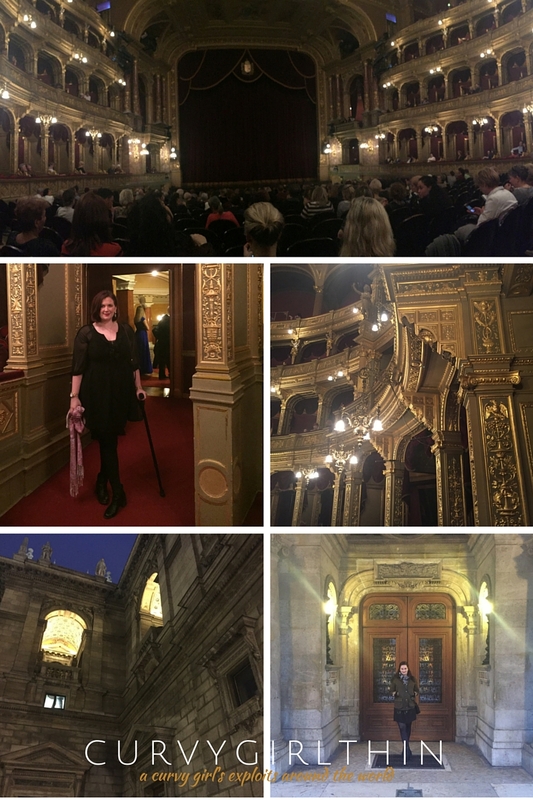 At the opera house, we were true aristocrats and spent every moment of the intervals people watching. We saw tartan trousers not on a Scotsman; a sparkly fan being not-so-elegantly wafted; evening gowns worthy of the Oscars (a sharp contrast to the women in jeans & trainer combos); a man in a tux; and full length operatic gloves. Unfortunately, I didn’t see anyone using opera glasses! We has some of the best seats in the house: centre stalls at the back meaning we had an almost unobstructed view of the opera house – the perfect opportunity to check out the panorama feature on our iPhones! After a lazy start (cause if you can’t have a lie in at breakfast when can you? ), we went for a decadent breakfast at the New York Cafe. Attached to on of Budapest’s most lavish hotel, the Boscolo Residence, this Baroque style 19th century cafe is a MUST for breakfast lovers. 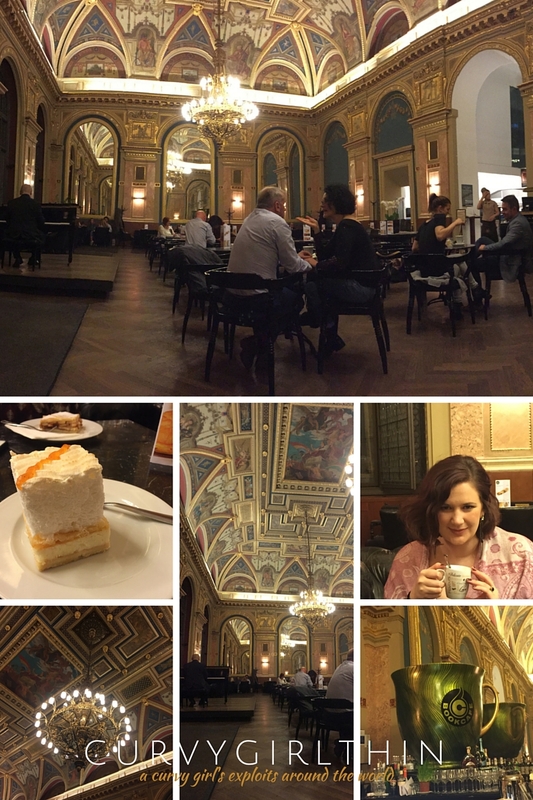 It isn’t the cheapest of Budapest’s cafes but the opulence of the place makes it worth every penny. We had a long, slow, lazy brunch or pancakes, bacon and eggs, meats and cheese, pastries and cakes. I have it on very good authority that the hot chocolate has to be sampled and their coffee, as with all Hungarian coffee, was strong enough to stand a spoon upright in! 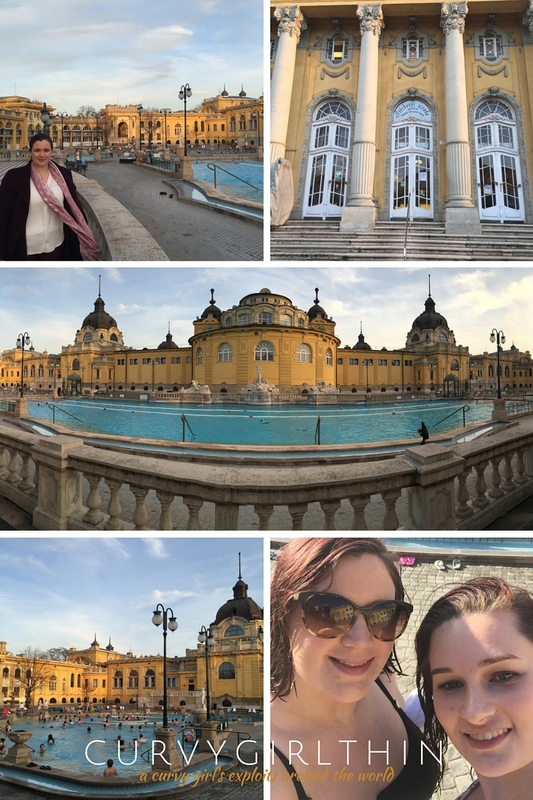 After the sheer indulgence of ladies-what-brunch, we indulged ourselves some more in the Szechenyi Baths – bathing outside in winter in Budapest may sound crazy but the large circular construction of the bath means that you’re sheltered from the breeze and the pools themselves are around the 30degree mark. It was also a beautifully bright day without a cloud in sight so I even felt brave enough to saunter about in my new Panache bikini* a bit. I will review this at a slightly later date! We spent a good 6 hours in the spa, having the most relaxing massages, and soaking up the sun’s rays – I even came back with tan lines, in February! Getting to the baths in the morning is a good idea as things got rather crowded with teenagers around 4pm – I have a feeling they flood to the baths after school! Feeling relaxed and refreshed we headed back to the hotel to shower and change before heading to the Book Cafe, Lotz Hall which I had heard wonderful things about. Now the decor in here is beautiful but the book shop it’s part of is basically a Waterstones (I had built up expectations of a crooked old antique bookshop so was quite disappointed at this). The hall itself is opulently decorated in the baroque style that I now see as being typical of Hungarian architecture. It is, however, a tourist trap and feels rather forced. That said, they do great cake, there was a live pianist, and I got to try a Bombardino, a warm custard-like drink of eggnog, brandy, and whipped cream. It was heavenly – but I could only ever drink one as it is suitably sickly! After coffee and cake we went for dinner – I know it’s completely the wrong way round but we were on holiday! When looking for the Book Cafe, we had stumbled across a cute look Hungarian restaurant that seemed to be bursting at the seems. We were lucky enough to get a table in the tiny little canteen and, after some confusion over whether it was £5 per dish or £5 for the entire three course menu (it was the latter), we feasted on goulash, paprika chicken, and a beef stew. Neither of us had room for the final course and I’m sure we missed out. We also drank some more of that super delicious Hungarian white wine! 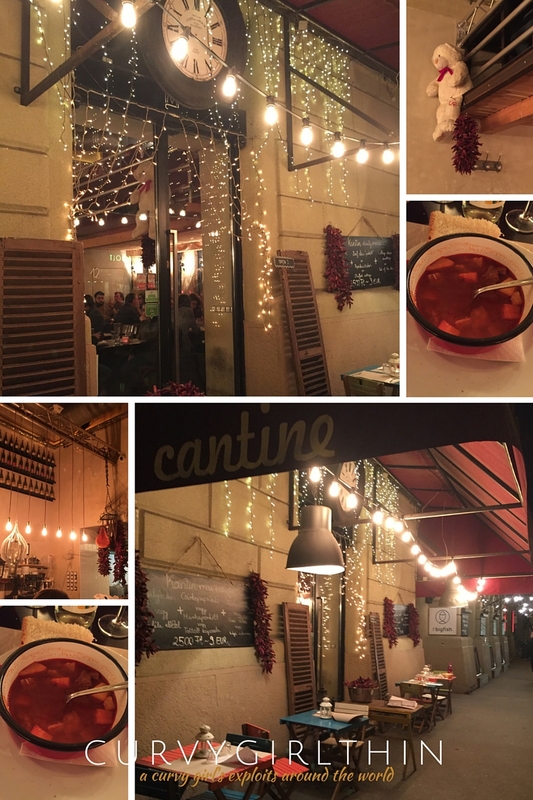 The restaurant was called Cantine (I couldn’t find a website) and, if you go to Budapest, do ask about it and make sure you book a table – I think we were very lucky to get in and they turned away loads of customers throughout the night. 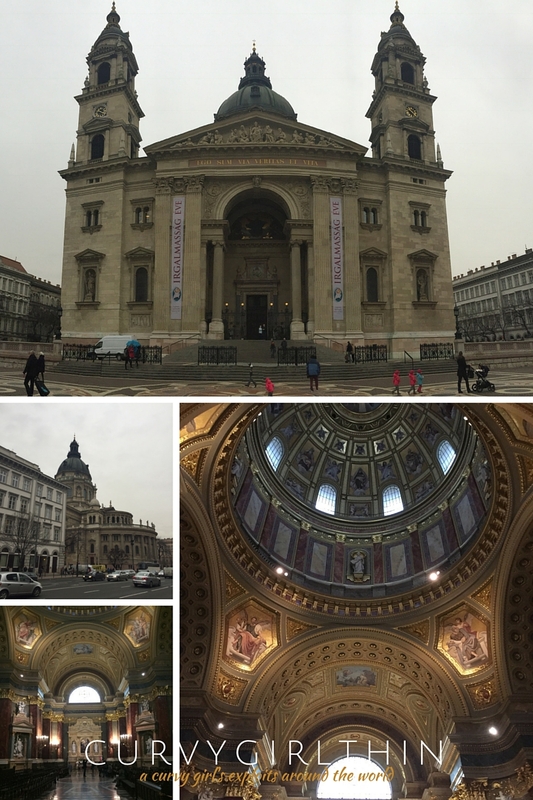 For our final day we decided to be terribly touristy – we started off with an early morning wander around St Stephen’s Basilica, a hugely imposing church that required a panorama shot to fit the entire thing into a picture! The inside was extravagance in itself! They do regular concerts there in the evening which we’d have loved to attend but, unfortunately, found out about these too late. By now we were peckish so wandered around the corner to cafe house, Művész Kávéház, that we’d seen opposite the Opera house. We ate eggs, drank coffee (and hot chocolate) and topped off a lovely breakfast with even more cake – Budapest has some really great cakes! 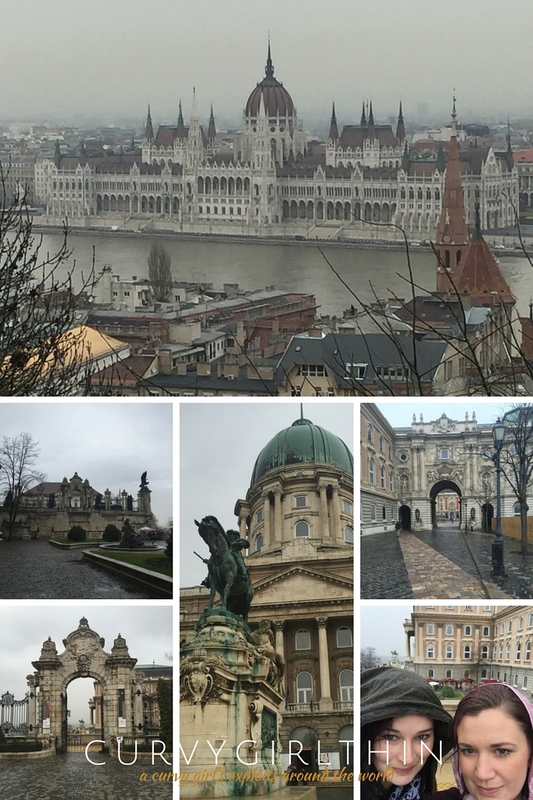 High on all the sugar, we grabbed a cab across the Danube to the Buda Castle district. I’ve been here before and was surprised at how tourist-y it has become in the 10 years since I was last here. It is still quite charming but is not the abandoned magical castle that I remember. 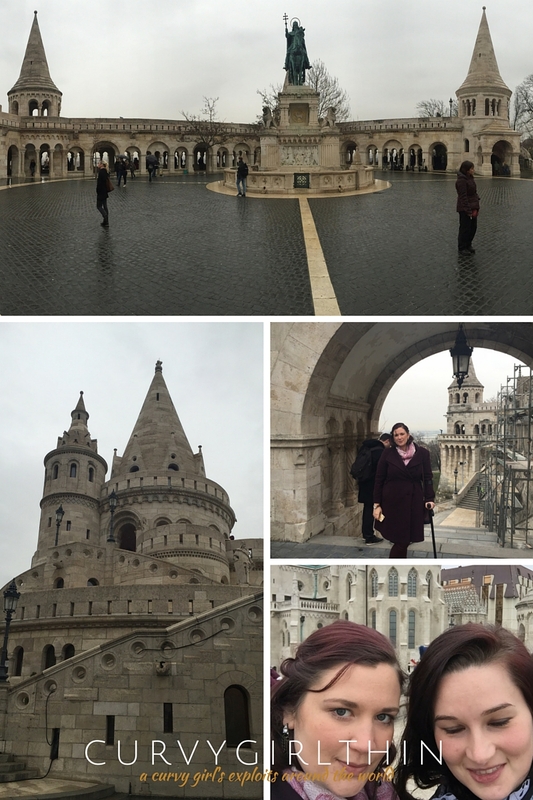 It was also raining – which was annoying – but I still enjoyed wandering around Fisherman’s Bastion! Next was the re-built Gothic Matthias Church that housed some pretty impressive patterns that I’m sure will be used in my printmaking workshop over the next few weeks! It was a cool church but, having been destroyed and rebuilt so often, it had lost some of it’s charm. It was a little too perfect, a little too pristine and would have benefitted from perhaps some parts being left in ruins as a reminder of it’s history! 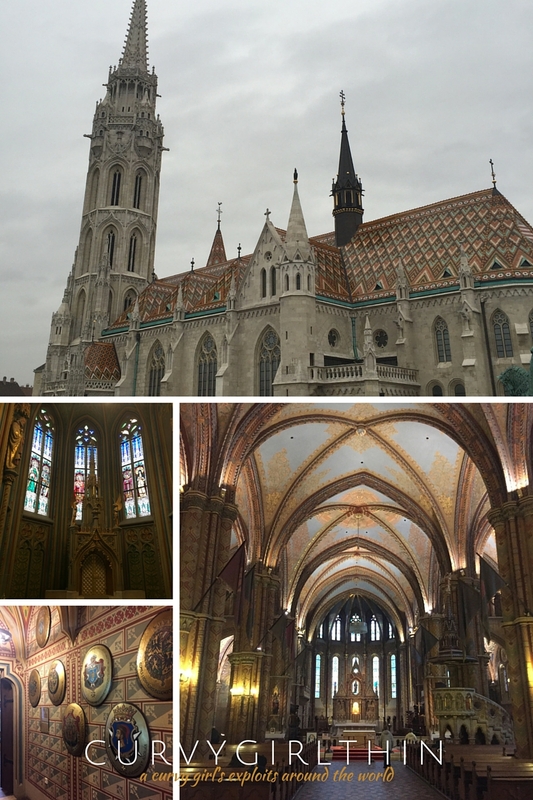 It had dried up a little by the time we’d finished wandering about the Matthias Church so we sauntered down to the castle which has been repurposed as several museum’s. Here there were also some really beautiful views across the Danube and you can really see for miles around – it was quite spectacular on a dull cloudy day but I think it would be break taking on a bight summers day with the sun hinting off the river. The parliament buildings especially make for a wonderful view and I would, if I ever find myself in Budapest again, like to take a closer look at them! 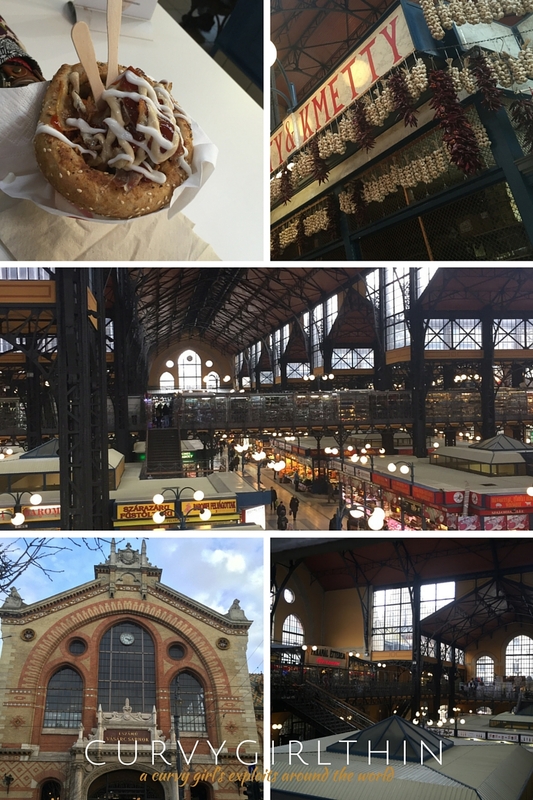 A quick ride down the vernacular railway (so cute), and we jumped into a cab to take us back across the river and to Market Hall – a local and tourist spot alike full of amazing (and utterly cheap) deli’s brimming with sausages and paprika. I picked myself up some smoked and sweet paprika to bring home and cook with – I’m gonna be attempting some goulash very soon! They also had plenty of tourist tat there – who doesn’t love a , mustard, chcorny fridge magnet? I managed to get a Budapest bauble for the Christmas Tree! Upstairs in the market hosts an array of street food stools that offer up some really delicious treats. We opted to share a bread cone filled with sausages, sauerkraut, mustard, cheese sauce and all sorts of other delights – it was basically pure gluttony. That evening, we headed out to play in a few of the ruin pubs in the Jewish Quarter – these are a strange assortments of bars that have grown up out of a war-torn city that hasn’t entirely been rebuilt. They’re popular among students and tourists alike and are definitely worth exploring. 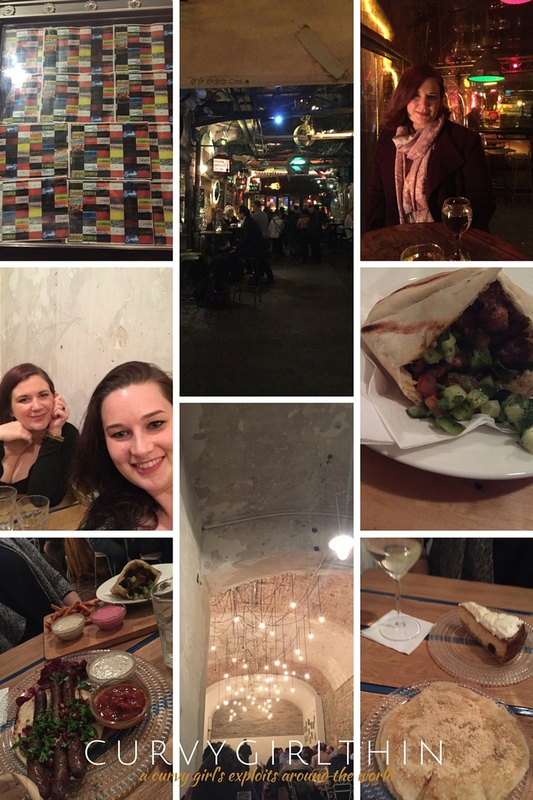 After drinking wine in Szimpla Kert, one of the more famous of the ruin pubs, we headed back to Mazel Tov for more wine, schwarma, and kosher sausages. There was a swing band playing and I ate pancakes for pudding, Tamara ate cheesecake. It was a great night! We were up early the next morning (3.30am) to get our flight home. Budapest was just what I need – we took things easy, indulged ourselves senseless, and cam home feeling rested and content. 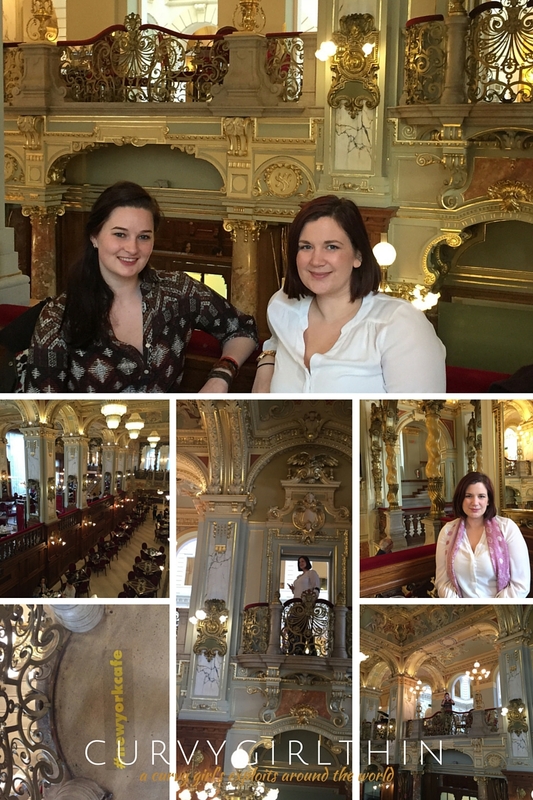 We didn’t scrimp or save when there and treated ourselves to some of the cities luxuries like breakfast at the New York Cafe, great seats at the Opera House, a private massages at the Baths. Despite this, we didn’t spend more that £300 each – and that included flights and accommodations. We got taxi’s almost everywhere and tipped generously. We couldn’t have done London so cheap – in fact one night out in London without accommodation has been known to cost almost as much as my whole trip to Budapest. Next on my list? I’m thinking Sarajevo or Belgrade! Hi! I can see you fell in love with Budapest as I did, too, 10 years ago. I’ve been back several times but I’m not familiar with the district of your hotel. So nice to read about your experience! Thank you for sharing this travel story and I just love your photos!